Best of all, meeting several of my imaginary friends, including Des Welsh all the way from Australia, at BlogWorld. Blogging is as much about fostering relationships as it is about writing. Yes, you can focus solely on pumping out content, but, by not engaging with your readers or other bloggers, you are missing out on the magic that the blogosphere offers. Blogging is instant publishing, the results are not. A traffic spike is not immediate once the “Publish” button is pressed. Patience is the key here! Anything can happen in the blogosphere. For example, last week’s post on tracking your contribution to the blogosphere was the result of a suggestion I had received on Andy’s blog. I created the spreadsheet for tracking comments and then decided to share with my readers, resulting in a flurry of comments from new readers and, at last peek, 50 diggs! I can make a living from blogging! This is the most exciting and affirming realization I gained from BlogWorld. All my life I have dreamt of having my own syndicated newspaper column in which to share my thoughts, ideas and perspective with the world. With blogging I no longer need to find that one newspaper willing to give me a break to get started. Blogs are my medium! And, at BlogWorld, I listened to bloggers who are making a full-time income from blogs and blogging, so I now know it is possible. In fact, this week I landed my first paid blog article, a direct result from BlogWorld. I know this is only the beginning! The more I learn about blogging, the more I realize I still have to learn! 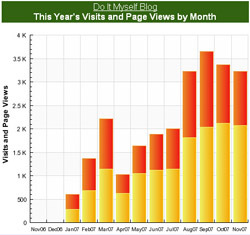 What you have learned about blogging this year? Feel free to share by leaving a comment below. Posting content consistently is the key to ALL social media these days — blogs, audio, video, etc. People have increasingly short attention spans, while competition for that attention is forever growing. If you don’t update regularly, people will consider you dead weight, even if they’ve subscribed (and thus require zero effort to “await” your next update). Cheers and best wishes in 2008! CONGRATULATIONS on your 1st paid blog article! You go girl! Congrats on the paid blog gig! Here’s to many more! Glenda, I don’t know what took me so long to get to your blog! It was great meeting you in Vegas. You going to Northern Voice this year? what have i learned about blogging this year? i think the biggest thing is, “ya never know”. i kind of suspected that last year but this year that’s become totally clear to me. you write the amazing post that you think will rock the world and nothing happens … and then you crank out some bleary-eyed post at 1:30 in the morning and it turns out to be quite a hit. it’s kinda fun, actually. Justin, I totally agree that posting consistently is key; readers need a reason to return and to engage. My biggest fear is running out of content to post. How do you maintain a steady flow of ideas and, subsequently, content posted regularly? Do you use an editorial calendar? That’s where I’m at the moment. Tris, I’m glad you’ve found my blog now! Welcome. Yes, it was a pleasure meeting you in Vegas. Let’s talk some more; I’d love to hear more about Blog Nation. Northern Voices is definitely a possibility. It’d be great to get involved with the local blogging community. Thanks Karla and Karen. 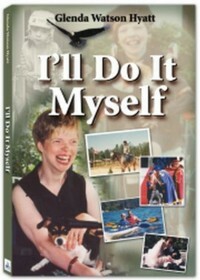 The article will be on traveling with a disability; a topic I have some experience with! Isabella, I understand what you mean – never know what will pique interest in the blogosphere! In fact, the idea for this post struck while I was getting dressed yesterday morning and mulled it while eating breakfast; the idea hadn’t percolated long, like other posts have, but it has already been dugg 43 times. Go figure! Perhaps the lesson here is not over censor yourself, you never know what posts will take off. You summed up the blogging life well. I am just learning too, but its a fun process. I truly believe we can earn money from blogging with constant content and great connections. You have a great perspective that others need to read. I am a slow typist as well (I type with my toes. ), and patience is not my strongest quality, so I nodded along with this post. Thanks Mike! As I mentioned last night, I sense the water’s surface tension is just about to break and then who knows what will come next. Very exciting! Blog on, Denise! It is an exciting time in history; our voices are being heard for the first time. Great read good point and to your #6 I will add: Its a giver gain. Great lesson, Renny. And congratulations on your Weblog Award! Congratulations on the paid blogging gig! Thanks Ruth! And, yes, regularity is the key. Good luck with your New Year’s resolution. Are you going to do any planning, ie. an editorial calendar, to ensure your resolution succeeds?